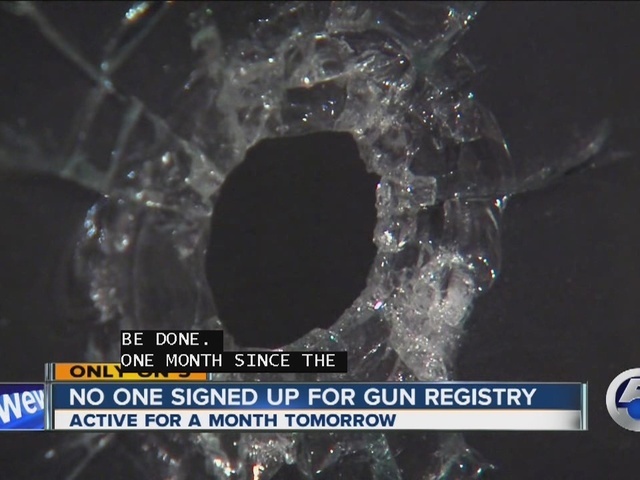 Tuesday marks a month since Cleveland's controversial gun registry program went active and in 30 days, not one person has registered. "We think perhaps not everybody knows about the requirement to register so we want to get that out there," said Tim Hennessy, Cleveland's assistant director of public safety, on Monday. Hennessy said he and public safety director Michael McGrath are now working with judges in Cleveland Municipal Court and the Cuyahoga Common Pleas Court to make sure people understand the registry is not optional. The gun registry, part of Mayor Frank Jackson's efforts to curb gun violence, requires people convicted of a gun crime to register—it doesn't apply to everyone who owns a firearm. It puts that information into a database accessible by law enforcement so police can use it as a tool, Hennessy said. "I would have been shocked if they came running to sign up," said councilman Jeff Johnson, who believes the registry will have limited impact on reducing gun crimes. He added that authorities aren't knocking on doors to find who hasn't registered; it will likely be used as an add-on to someone who has committed another crime. "It's more sizzle than fire," Johnson said. "The thought is that those who have committed gun crimes will commit gun crimes again and that's not necessarily the way to approach anti-violence legislation." Those who fail to register within the required five days of conviction could be slapped with yet another charge—a first-degree misdemeanor that could come with six months in jail and a $1,000 fine.